This detached Isle of Wight holiday cottage is located in the heart of Sandown and is within a few minutes walk of the sandy beach. The town is ideal for holidays as it has many facilities including shops, restaurants and other entertainment. The holiday cottage features one double bedroom with a studio room built into the roof space with a double sofa bed, TV, DVD and CD player. It also has a lounge with dining area with ceramic tile floor, shower, bathroom, fitted kitchen and an enclosed courtyard patio area with brick built shed for storage. All mod cons available including washing machine/dryer, microwave, gas oven, fridge/freezer and gas central heating. Linen and towels are provided. 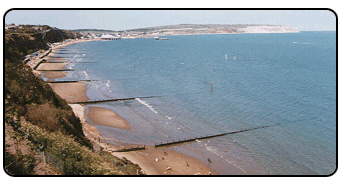 Sandown Bay is one of the most popular beaches on the island, with it's long stretch of uninterrupted, sandy beach. There are plenty of amenities, with activities to suit all including surfing, jet skiing, pedalos and windsurfing. The beach is also well served with refreshment kiosks along the seafront. At the Heights on Lake Hill there is a 25 metre pool as well as a smaller pool for learners, a gym, squash courts, sauna, steam spa, bar and bistro (within walking distance). The Zoo, at the eastern end of the town, has big cats and many other species, notably snakes, and is now internationally recognised as having one of the best tiger sanctuaries in the world. This is being expanded in 1999 on land the zoo has just acquired. Closer to the centre of town is the Geological Museum, which interprets millions of years of fossil history and displays footprints of the dinosaurs that once enjoyed the natural pleasures of Sandown Bay. Close to Sandown is an 18-hole golf course and the airport, where there is a front-line and aviation museum, a speciality flying school, and where, between Easter and the end of September, pleasure flights can be arranged. You can also visit Dinosaur Aisle where you can learn about the history of dinosaurs and which also features replicas. For those without a car, Sandown Railway Station is just 15 minutes walk. There is also a large Sommerfield just a 2 minute walk away. The best ferry crossing is Portsmouth - Fishbourne, as the cottage is just a 20 minute drive from this port. 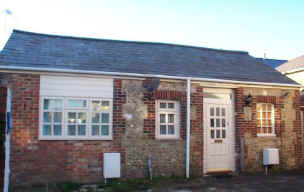 You can also use Southampton - Cowes, but the cottage is then a little further away. Guests can normally arrive by 4pm on their day of arrival and will be required to leave by 10am on their day of departure. The cottage is non smoking, but it is possible to smoke in the courtyard which is accessible through an open door in the bedroom. Guests with babies should bring their own travel cot and stair gate if required.